Professional Equipment offers a full line of professional-quality video borescopes to help home inspectors, HVAC technicians, restoration/remediation contractors and other trades people inspect wall cavities for moisture and mold, evidence of pests (such as termites or rodents), leaking pipes and many more. The product lineup includes video borescopes, inspection cameras and camera systems from popular brands, including Extech®, Rigid®, General Tools® and Testo. 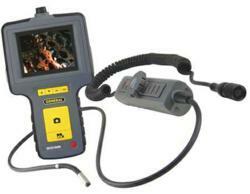 Professional Equipment offers a full line of professional-quality video borescopes to help home inspectors, HVAC technicians, restoration/remediation contractors and other trades people inspect wall cavities for moisture and mold, evidence of pests (such as termites or rodents), leaking pipes and many more. Ever wanted to know where pipes and electrical wires are before cutting a big hole in the drywall? Need to check out that heat exchanger in the furnace to see if it’s cracked? A quality borescope helps contractors look in hard-to-see places. The product lineup includes video borescopes, inspection cameras and camera systems from popular brands, including Extech®, Rigid®, General Tools® and Testo. Professional Equipment’s large selection allows the choice of price range and feature set that is right for any given situation. The best selling Extech Video Borescope with Wireless Monitor ($299.99) has a detachable wireless monitor that can be viewed up to 30 feet away from the actual unit. Available in two head sizes: choose the 17mm for $299.99 or the 9mm ($349.99) for getting in even smaller spaces. Need to inspect a long drain pipe? Pick up a Rigid Micro CA-100 ($254.95). This customer favorite can be extended to a total of 30’ using either 3’ or 6’ extensions (sold separately). Both the borescope extensions and the camera are waterproof to a depth of 10’. For the serious professional, the Articulating Data Logging Video Borescopes System from General Tools offers substantial features. Directing the articulating probe with a knob-and-button system not unlike a video game controller, allowing its user to look left, right, up and down and keep the image right-side up. Unit also offers TV output or computer monitor output. A call to Professional Equipment’s expert technical support department makes the selection process easier. With a full walk through of the benefits of each model will assist making the right selection. Professional Equipment, founded in 1987, is the leading national distributor of top-quality testing, diagnostic and measuring equipment used by home inspectors, energy auditors, restoration contractors, HVAC contractors, electricians, property managers, general contractors, roofing specialists, insulation installers, architects, commercial building inspectors, insurance adjustors and other construction-related trades. The PE catalog sports more than 150 pages of full-color photos of testing equipment, safety supplies and building trade support products from the best brands in the industry, including FLIR, Extech, Bacharach, Tif, Fluke, GE, Tramex, Delmhorst, Leica, Streamlight, TPI, Amprobe, UEI, The website, ProfessionalEquipment.com, boasts even more equipment with 14,000 items complete with product reviews. To request a catalog, visit http://www.ProfessionalEquipment.com.